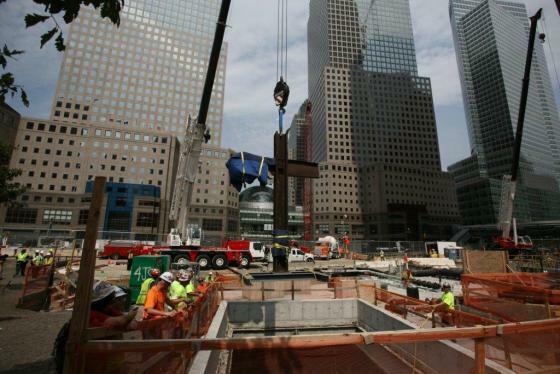 A crane lowers the “WTC Cross” into the National September 11 Memorial and Museum. Image credit: National September 11 Memorial & Museum. Atheist organization claimed that the steel-beam cross found by recovery workers at Ground Zero and displayed in September 11th museum violated Constitutional and State Law. In July 2011, a coalition including American Atheists, Inc. brought an action against the Port Authority of N.Y. & N.J. and the foundation responsible for developing, designing and operating the National September 11 Memorial and Museum regarding the display of a large cross in the museum. The seventeen-foot cross, made of two steel structural beams, was found by recovery workers in the debris after the destruction of the World Trade Center, and erected at the site, where it served as a focal point for religious services, and was later removed to nearby St. Peter’s Church. The cross is displayed as part of an exhibit titled “Finding Meaning at Ground Zero.” The museum is sited where the World Trade Center stood, on property owned by the Port Authority, and is funded largely by Federal and State money. The cross is one of approximately 1,000 objects on display at the museum, and is presented with text panels explaining its historical significance in the recovery effort. Other religious and secular items are also displayed, including a Star of David and an image of the Manhattan skyline crafted from steel found at the site. On July 27, 2011, American Atheists brought suit against the Port Authority and the museum, claiming that to display the cross would violate the U.S. Constitution’s Establishment Clause and Equal Protection Clause, as well as New York and New Jersey’s State Constitutions, because the prominence and size of the artifact gave primacy to Christianity and no equivalent atheist symbol would be exhibited. The petitioners claimed the Foundation running the museum was sufficiently enmeshed with Federal and State governments to make it a state actor, and the cross served as an official endorsement of one religion over others. On March 28, 2013, U.S. Southern District Judge Deborah Batts dismissed the case, finding that the display of the cross was historical and secular, that the museum setting negated any perceived religious endorsement, and that no reasonable observer would understand the object as an endorsement of Christianity. The display did not serve to advance or inhibit any religious faith, and was rationally related to the museum’s goal of explaining the history of the September 11 attacks. No significant entanglement between the church and the museum was found, though the cross was housed in a church at one point. On appeal, American Atheists claimed that the exhibit violated the Equal Protection Clause because no plaque recognizing that atheists were among the victims and rescuers would accompany the display. On July 28, 2104, the U.S. Court of Appeals, Second Circuit denied the appeal, upholding the district court’s determination that the display of the cross did not constitute an endorsement of Christianity, and its context made clear that its purpose was secular and historical rather than theological. The Second Circuit ruled that a reasonable observer would not perceive a plaque recognizing atheism as an artifact of the events of September 11, that the plaque would not further the exhibition’s purpose in demonstrating how people found meaning at Ground Zero, and that the museum was not required to include one in the exhibit. American Atheists, Inc. v. Port Authority of N.Y. and N.J., 2014 WL 3702452 (2d Cir. July 28, 2014) (Attorneys: Edward F. Kagin, for American Atheists; Mark H. Alcott, for Foundation; Megan Lee, for Port Authority). By: Jesse Denno (Jesse is a full-time staff writer at the Center for New York City Law).